Canoe Polo is basically water polo, in canoes! Teams of five players pass the ball in order to move closer to the opponent’s goal, ultimately to achieve good shooting positions and score a goal! It is difficult to describe the passion and excitement which is created when a Canoe Polo game is in progress. Participants speed the length of the pool, weaving through their opponent’s lines of defence and spinning in their craft to receive passes. It makes for a fast and thrilling event. Canoe Polo can be played indoors or outdoors and is a great spectator sport because all the action takes place in a confined area. Canoe Polo rules allow those in possession of the ball to be pushed over. This ensures that the ball is in almost constant motion as players try to find space in good positions in which to receive the ball. The opponents chase the player with the ball and try to mark those who might receive it. While the ball is mostly thrown and caught with the hands, the more skilful players can flick the ball with their paddle. For official competitions all competitors use an internationally regulated type of kayak. The design combines sprinting speed with aggressive maneuverability and is usually padded at each end to prevent injury. Other injury prevention measures include thicker paddle blades and face guards. Many canoe clubs play canoe polo for fun in a variety of craft. Some clubs have specialized boats and equipment and take part in organized leagues. There are three polo leagues in operation in Ireland, in Limerick, Belfast and Dublin. 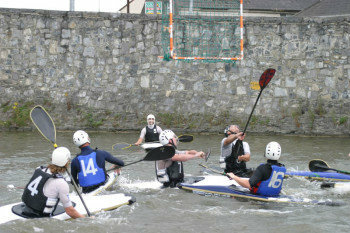 The Irish Open Canoe Polo Championships is held in Kilcock each year and utilises the Royal Canal as a superb outdoor venue. In addition, Ireland sends teams to European and World Championship events.